The 1,140 square foot condo opens up to a nicely decorated spacious living area complete with large screen plasma television. The well appointed, open kitchen provides everything you need to feel right at home, including all utensils, such as microwave, coffeemaker, toaster and more. The eating nook offers comfortable seating for six to enjoy a meal, or playing board games. The nice sized bedrooms contain two doubles in the master and two queen beds in the second bedroom as well as televisions offering privacy and comfort. The spotless bathrooms with plenty of towels, linens, and extra pillows, are here. 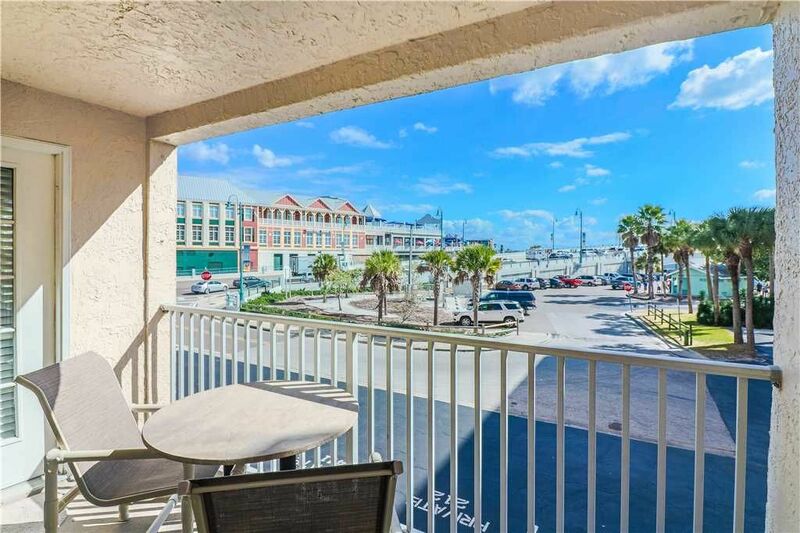 The beachfront heated pool is a quick walk as are the many amenities including BBQ, and nearby coin laundry facility. A major highlight is the easy access to John's Pass Village, with its unique shopping, one of a kind restaurants, all on a pirate themed 1,100 foot boardwalk. During the summer there are often celebrations with music, art shows or a host of other popular events. All guests have daily access to the office staff as well as services such as faxing, copying, and printing boarding passes. In those rare times where maintenance is needed, there is an after hours emergency on call attendant. South Madeira Beach is a sought after community, just west of St. Petersburg. Its 2.5 mile beach is popular with sun lovers and offers some of the best fishing in the area. John's Pass is a popular attraction with unique shopping, incredible restaurants, art shows, musical entertainment and a 1,100 foot pirate themed boardwalk offering a fun experience for the entire family. Upon arrival there was a runner rug at the front door that was dirty and smelled terrible (we rolled it up and put it in the closet for the remainder of our stay). As we put away our stuff we noticed a terrible smell in the kitchen, and realized it was the garbage disposal. We used lemons that we brought with us and cleaned it. The carpets in the bedrooms are old and dirty. All of the dishes and utensils were dirty, and had stuck on food on them. The WiFi was terrible.. we know vacation is for escaping but if you need to conduct any sort of business, this is not the condo for you. Even if the WiFi worked, the plugs are all loose so you can’t plug in your electronics anyways. Sleep was pretty much impossible. Cars on the bridge are loud, and there was construction next door. There was jack hammering as early as 7am. Just when we thought we were getting a break from that on the weekend, the lawn maintenance came and then a fire alarm at 4am on Monday morning to finish our trip. Needless to say, we won’t return. It was a great stay...just dirty carpet in condo. Another great stay at Beach Place. We will be back.